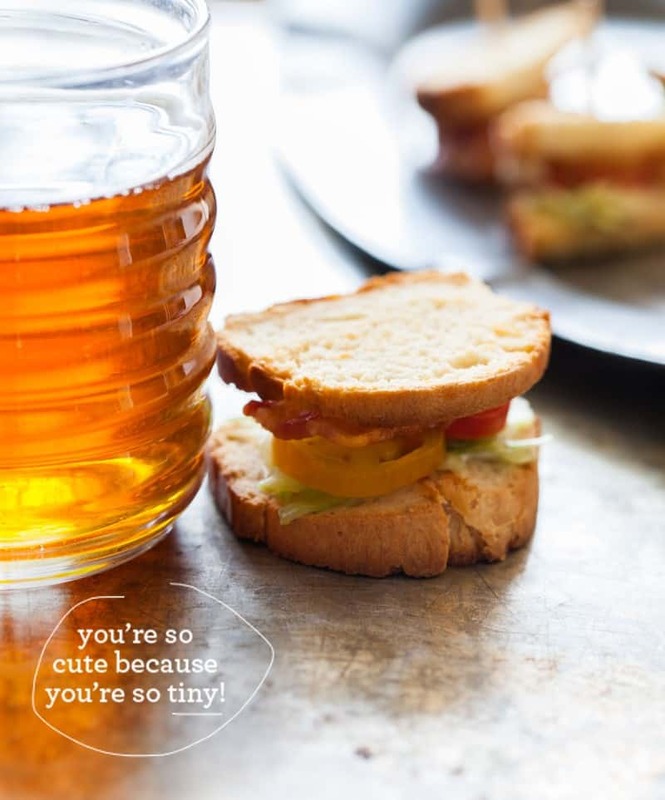 Teeny Tiny BLTs + Our Book! Hi Guys! We have some pretty exciting news we’ve been dying to share with you all: We’re coming out with a COOKBOOK!! That’s right, Tiny Food Party is coming out fall 2012, October 9 to be exact. For the past year, we’ve been playing working like crazy to produce a pretty little cookbook, with some fun and delicious recipes. Why Tiny Food Party? Bite sized foods are awesome and we’re sure you guys have noticed we have a bit of a thing for small bites. Tiny things are so freaking cute, and when you pair that with food it’s magic. This is the perfect book for entertaining, or just being awesome. In Tiny Food Party you’ll notice some classic foods and dishes turned tiny, like Teeny Chicken Parmesan Crostini, Super-Small Deep Dish Pizzas, Mini Homemade Pop Tarts, and Teensy Funnel Cakes. Not only do we recreate classic American dishes, but we also dabble in international fare, with some of our favorite foods teensified! Don’t think we’ve forgotten cocktail hour! Our cookbook definitely includes a cocktail section with quirky adult beverages including a mind blowing Itty Bitty Bloody Mary. Lets just say there are pickled green beans involved… and candied bacon rims….and deep fried quails eggs. If any bloggers would like a review copy, just holler! Really! There is a limited supply available, so get yours now! Pretty please?! Email us at hi@spoonforkbacon.com with the subject like “I want to review Tiny Food Party! YAY!” and leave us your name and the name of your blog, then we will be in touch. Wooo! We are really excited, so to kick things off we have some Teeny Tiny BLTs for you today. Isn’t the miniature bread adorable? We hope you are all as excited as we are! You can head on over to Spoon Fork Bacon’s Tiny Food Party! page for more info on the book and find out where to buy it. Go there. *UPDATE – we have gotten tons of emails for people wanting to review Tiny Food Party! YAY! Thank you! We can only choose so many, so if you decide to email us, please send us a link to your blog! Thank you! 1. Preheat oven to 350°F. Place cut loaves into 1½”x 3” mini loaf pans and allow formed loaves to thaw and proof in a warm area until doubled in size, about 1 to 1 ½ hours. Place loaves into the oven and bake for 35 to 45 minutes or until golden brown and cooked through. Remove loaves from the oven and the mini pans and allow to cool completely. Thinly slice loaves into ¼ inch slices and gently toast. Set aside. 2. Place oil into a heavy bottom skillet over medium heat. Add bacon strips and fry for 4 to 5 minutes. Flip bacon and cook for an additional 2 to 3 minutes. Drain on paper towels and cut each strip into four pieces. 3. To assemble: Spread a small amount of mayonnaise onto each slice of bread and top half of the slices with bacon, lettuce and tomatoes. Finish the sandwiches with the remaining bread slices, secure with toothpicks and cut (if desired). Serve! so cute!!! and congratulations on the book! I am so excited for you all!!!! I don’t usually buy cookbooks, but this one needs to happen! Now I have no excuse to have a lot of parties. Can’t wait for the book! Can’t wait! I’ll definitely be buying a copy. I agree that tiny foods are so cute and great for entertaining. You rock! I always like seeing your posts and pics. Congrats! Congrats you two! My friends and I have made so many recipes from your site and they are so good. Can’t wait to see it! Great job ladies! I sent an email about a review copy! I am totally stoked for you!! OMG. I am so excited for you both. I love the concept. I throw tons of parties and this would be a great resource. I’m emailing you guys after I hit the comment button. :) congrats. So excited. Congrats! And these BLTs look awesome!! Congratulations! This is excellent news :) I’m sure I’ll reference your book for parties in the future. Can’t wait to see it! We don’t need to request review copies but we’re AUTOMATICALLY GETTING A BOOK, RIGHT? RIGHT? Congrats! This is so exciting! Can’t wait to get my hands on a copy once it’s out … Will definitely be my go to cookbook! Tiny food means you can eat more of it right?! :) Congratulations ladies..how fun! Freakin’ amazing! Can’t wait to get my hands on this book. Looks rockin’! Congrats!!! YAY!! I love love love this book/idea/cover/everythingandanythingaboutit !!! Congrats you two! I can’t wait to get the book in my hands and start whippin’ up mini-foods! This is SUCH fantastic + exciting news!!! I absolutely LOVE + adore the cover, the title, and the whole premise of the book. I cannot wait to see all of the lovely photos and amazing recipes. CONGRATS!!!!!! Congratulations!! This sounds like it’s going to be an amazing book and I’m pretty sure I’m going to want to eat every single thing in it! YAYYYYYYYYYYYYY! So, so, so excited! Can’t wait to get my hands on it! Congrats! I love part food that’s easily consumed in 2 or 3 bites. This is so exciting, the cover is fabulous, congratulations! !!!! Tiny food for everyone !!!! I cannot wait to add your book to my collection and perhaps through an impromptu cocktail party. Congrats! Oh my goodness, this sounds like it will be awesome! Those teeny Bloody Marys?! Yes please! Adorable! Congrats on the book! Massive congrats to you two! You totally deserve every ounce of success and I cannot wait to see this book – I bet it’s going to be AMAZINGLY gorgeous & adorable! oh my gosh, congratulations!!!! Ordering a review copy right now! Those BLTs look so nice!! Congrats on you book, way to go!!! I’m going to love it! Congrats on the new cookbook! Tiny food is super cute. Wow, congratulations! I’m so excited for your cookbook. Congratulations to my favorite food bloggers, now favorite cookbook writers! The BLT gif is the coolest thing ever. Congrats to you! Hooray! *throws confetti* I can’t wait to see it! Crazy! I just ordered this book for my store today– & totally didn’t realize it was you guys. So excited!!!!! Congratulations! Hoora! Bravo ladies. Can’t wait to get a copy. Stinking adorable! I cannot wait to see the book! Tiny pop tarts? Yes please! How exciting! I love tiny bites. :) Can’t wait to get a copy, and hopefully I will get the chance to review it! Congrats! I CANNOT WAIT for the book!!! emailed you this morning (with my blog address!) & hopefully I get to review a copy…YAY!!! My Heros! :) Congrats ladies of my morning coffee and doughnut read! will def be getting a copy!!!! It was such a pleasure meeting you girls in Louisville and I am so happy for you! Much success! I wonder if your book will be launched worldwide or if it’ll be available on Amazon, ’cause I’m from Brazil and I really want to buy it! 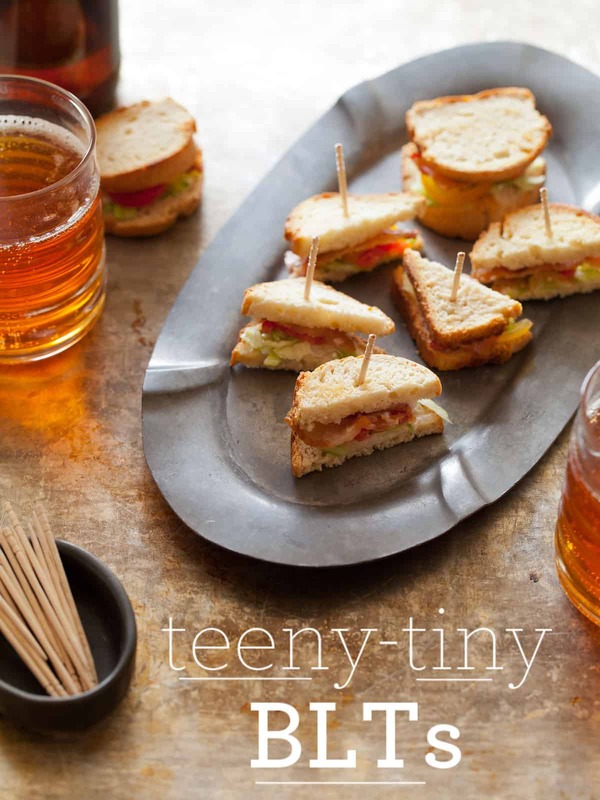 Yay for teeny tiny party food and yay for your new cookbook! Super big congrats to y’all! I’m sure you have enough people who want to review your book, but if you need another name, I’m on board! http://www.monkeybreadandsweetpea.com I love the image of the BLT being created on this post! Love it!!! This is AWESOME news!!! I seriously cannot wait for this book – you two ladies freakin’ rock! I love the teeny tiny BLT. What a fun little bite. Cant wait to see the book. Hi! Congratulations – I cannot wait to get my hands on a copy of this book. I LOVE TINY THINGS!!! Thanks so much for making a book full of them, beautifully photographed and explained. As a side note, I would love to know how you make your animated photos! Are they gifs? They make your posts extra special and I would love to know how to create my own! I’d love to review your delightfully cute cookbook. the food looks so delicious.